Most CPU cooler launches aren't exciting enough to cover, but this latest product from Corsair looks like an interesting and unique solution for those wanting to liquid cool their processor in a mini-ITX case. The Hyrdo Series H5 SF is an all-in-one closed-loop liquid cooler that offers 150W of heat dissipation in a product just 84mm tall. The cooler comes with a CPU block, radiator and a blower-style fan, and is designed to sit directly above a mini-ITX motherboard without blocking any crucial ports, allowing you to still install a graphics card in your system. 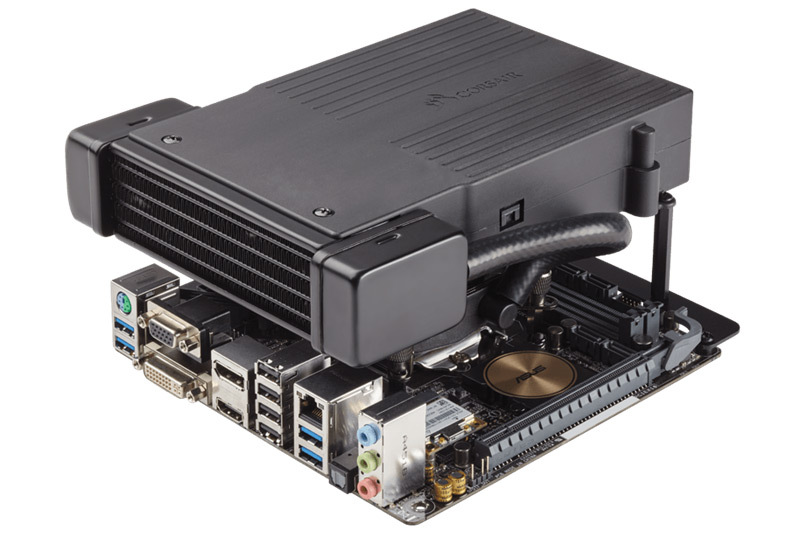 The H5 SF, which is also part of Corsair's Bulldog chassis, attaches to mini-ITX motherboards by using the mounting holes that also secure the board to the case. This ensures that the cooler can be mounted without needing additional supports inside the case, and should fit everywhere that a standard 84mm-tall air cooler would. Corsair claims that their small form factor liquid cooler is able to keep an 84W Intel CPU at under 70°C, where other mini-ITX coolers would reach 100°C. The 120mm blower fan is also "low-noise tuned", so it shouldn't be particuarly loud during load, at least not as loud as the graphics card in your system. The Hydro Series H5 SF is available now through Newegg and other retailers for $79.99, which is similar in price to the company's other liquid coolers. If you want something small and effective for your next mini-ITX build, this might be the cooler you're after.